Check out this month's On the Web links, your connection to earth science friendly Web sites. The popular Geomedia feature is now available by topic. Flock of Dodos: Evolution going the way of the dodo? 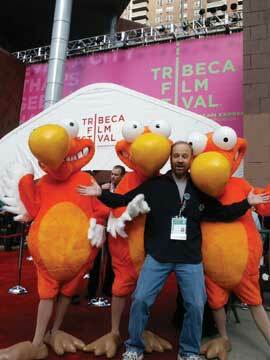 Filmmaker Randy Olson poses with a flock of dodos at the April-May 2006 Tribeca film festival, where his film Flock of Dodos: The Evolution-Intelligent Design Circus made its world premiere in the festival’s discovery category. Photograph is by Katarzyna Balug. When it comes to communicating science to the public, scientists — armed with daunting jargon and an unusually deep understanding of complex topics — can come off sounding like a “flock of dodos.” At least that’s the point emphasized by filmmaker Randy Olson in his latest documentary of the same name. By showing how people on both sides of the evolution and intelligent design controversy communicate (or don’t), the film demonstrates that evolutionary scientists need to polish their communication skills, or face extinction — just as the dodo did in the mid- to late 17th century. “Randy’s film is an entertaining and amusing wakeup call,” says Eugenie Scott, executive director of the National Center for Science Education (NCSE). That wakeup call is intended for both scientists and the general public alike, Olson says, to better understand the large-scale, organized and well-funded movement supporting intelligent design, or ID — the belief that the complexity of life is evidence that something intelligent must have designed it — which has been disguised as science as a means to edge creationism into the classroom. The film takes the audience to Olson’s home state of Kansas, the site of much controversy over the teaching of ID in public schools (see Geotimes, December 2006). Here, we meet Olson’s mother, Muffy Moose, whose expertise on evolution and intelligent design admittedly does not go beyond a keen interest of the debate that drives her to clip newspaper stories about the subjects and mail them to her son in Los Angeles, Calif. Such stories, along with the discovery that the leading ID lawyer in Kansas is Moose’s neighbor, lead Olson back to Kansas to sit down with the leading ID proponents, and then with eight scientists over a game of poker. The result is an eye-opening look at the different approaches to the debate and the people behind it. The story is one that Olson is qualified to explore. That’s because Olson, like the poker-playing characters in his film, was also once immersed in a world that used words such as “hybridogenetic complexes” and “allopatrically speciating,” earning his Ph.D. in evolutionary biology at Harvard University and studying under the late Stephen Jay Gould. In the mid-1990s, however, Olson moved to Los Angeles to pursue a graduate degree in cinema/television at the University of Southern California. Earlier media projects include the establishment of Shifting Baselines, a project to use comedy and film to communicate the issue of the declining state of Earth’s oceans. Humor is also woven throughout Flock of Dodos, helping bring the issue to mainstream audiences in an entertaining way. Still, the problem faced by evolutionary scientists appears serious, as the ID movement is being pushed by friendly, likeable people who know how to communicate, Olson shows us. For example, the audience meets smiling Connie Morris, a conservative Republican elected to the Kansas school board in 2002, who has reportedly called evolution a “fairy tale,” according to the film. ID proponent Michael Behe of the Discovery Institute also makes an appearance, coming off as accepting of evolution in many cases, only holding that a designer is required when nature becomes “irreducibly” complex, typically at the cellular level. And finally, conservative Republican Kansas school board member Kathy Martin invites Olson into her home to chat over a glass of lemonade. 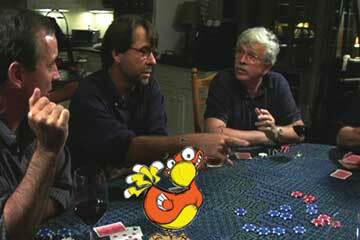 Eight scientists gather for a game of poker, as well as to discuss the evolution and intelligent design debate. Photograph is by Shane Seley. The contrast set the stage for discussion Feb. 19 at the Lawrence Hall of Science at the University of California, Berkeley, where audiences gathered for a screening of Flock of Dodos: The Evolution-Intelligent Design Circus, followed by a discussion with panel members that included NCSE’s Scott. The audience was mostly science fans, and one scientist in particular raised the concern that while the film describes the problem, it leaves the question open as to what to do about it. Olson can’t be faulted for that, Scott says, as providing a solution was not the point of the film. “But the frustration is there and it’s understandable,” she says. Part of the communication problem exists because scientists are already pressed to do research, write grants, teach classes and “don’t have much of a life,” Scott says. “Now we tell them they have to go out and be chummy with the public.” Without any institutional rewards, scientists might be less inclined to do so, she says. Still, if the scientific value of evolution is to be maintained, scientists need to take action. While the ID movement appears to have lost steam in recent months, with the major court cases ruling in favor of keeping ID out of schools in Dover, Pa., and Kansas, evolutionists are still “losing in the court of public opinion,” Scott says. In a study published Aug. 11, 2006, in Science, Scott, along with colleagues Jon Miller and Shinji Okamoto, found that the number of Americans who accept evolution has declined. The number of Americans reporting that they are unsure, however, has increased, and these are the people who scientists can reach and educate, Scott says. To see Flock of Dodos, visit the film’s official Web site at www.flockofdodos.com for a list of scheduled screening locations. Alternatively, catch Flock of Dodos during its premiere on Showtime, scheduled for May, or find it on DVD-home video in August. DVD-educational sales are available now at www.der.org. ISBN 10 0 691 12807 8. To author Susan Hough, Charles F. Richter was an “accidental seismologist.” His hobby as a teenager was astronomy, and his degrees at Stanford University and Caltech were in physics, not seismology. But his career was “accidental” in another way: It almost didn’t happen at all. Richter’s personal life was troubled. Raised in a single-parent household with no father, he was a classic nerd, lacking social graces and possessing a huge inferiority complex. He started a graduate program at Stanford but dropped out and entered a sanitarium for a year. Richter later attended lectures in physics by Robert Millikan, which inspired him to return to graduate school, this time at Caltech. At the time, Millikan was building the former Throop Institute into a world-class university. Caltech had arranged with the Carnegie Institution to build, under the direction of Harry O. Wood, a seismological laboratory that soon became (and still is) known as the Seismo Lab. Richter, a newly minted theoretical physics Ph.D., was hired by Wood in 1927 to analyze data being produced by a new seismograph invented by Wood and an astronomer, John Anderson. The earthquakes in 1925 in Santa Barbara Calif., and 1929 in East Whittier, Calif., made it clear that understanding earthquakes using the Wood-Anderson seismograph was important. Caltech formed a geology department that included world-renowned German seismologist, Beno Gutenberg. The size of those two pivotal earthquakes, however, could not be determined, as the technology only measured strong shaking at a specific locality, and ignored distance. Richter incorporated a 1931 suggestion by K. Wadati that correcting for distance was necessary, and designed a scale based on the maximum amplitude of squiggles on the seismogram. In her book, Hough concludes that although Gutenberg had worked on the scale, the idea was essentially Richter’s. And the intention of the scale was not global; it was designed for California as measured by the Wood-Anderson seismograph. The question soon arose of what to call the instrument. Influenced by astronomy, Richter called it magnitude, turning the astronomical scale on its head: Brighter stars have a lower magnitude number whereas larger earthquakes have a higher number. When Richter published his magnitude scale in 1935, he became a celebrity — arguably the most famous seismologist of all time. The scale could not measure the size of all earthquakes, however, and Gutenberg, especially, knew it. He and Richter worked on other scales measuring body waves and different wave frequencies that would lead their successors at the Seismo Lab to devise the moment magnitude scale, still used by seismologists today. But Richter’s name stuck, and has often been used out of context. Some reporters, for example, gave the magnitude of the 2004 Sumatra earthquake as 9.3 on the “Richter scale,” rather than the moment magnitude scale, which would have infuriated Richter. Perry Byerly of the Berkeley Seismograph Station even suggested calling the measurement the Richter. Taking her cue from A Beautiful Mind, Sylvia Nasar’s biography of the mentally disturbed Nobel Prize-winner, John Nash, Hough explores a side of Richter that few of his professional colleagues knew, in addition to discussing his professional exploits. Richter was a published poet, and he anguished over whether his future was as a poet or a scientist. He and his wife Lillian had an unconventional marriage. Hough also considers the possibility that Richter had a form of autism called Asperger’s syndrome. Clues included his difficulty in social situations, his sensitivity to bright lights and loud sounds, lack of motor skills and of personal organization, difficulties in changes in routine, inability to laugh at himself and outbursts of temper. Richter became the world’s most famous seismologist, but was he the best among his professional colleagues? Probably not. Even at Caltech, Gutenberg was the star, and Richter would have agreed. Yet to credit Richter’s stature only to the magnitude scale that bears his name would be a mistake. Hough suggests that his greatest contribution was his 1958 textbook, Elementary Seismology, which I still consult nearly half a century later. Clarence Allen, Kerry Sieh and I, writing our own textbook on earthquake geology, took Richter’s book as our lodestar, wondering if we could even come close. We tend to glorify the founders of earth science, but they are less interesting on their Olympian heights than Hough’s Richter, who jumps off the page as a multidimensional human being, tormented by demons but also subject to flashes of intuition that later would be confirmed in today’s digital age. Hough’s book takes us to the early days of the Seismo Lab, with cameo appearances by graduate students and postdocs who are now among the world leaders in earthquake science. If we are to understand our seismological roots, Hough’s book is a necessary first step. Yeats is senior consultant with Earth Consultants International and emeritus professor at Oregon State University.